If you plan to distribute your solution we highly recommend the iMacros Enterprise Edition which includes 5 player licenses for use inside your company. The option to install and run in the background (no visible user interface). 5 installations within your company or organization. The Enterprise Player license allows you to distribute macros, scripts and programs based on iMacros along with a copy of iMacros itself to your users *within* your company. Technically speaking this means that if iMacros is unlocked with the player license key your users have all the features of the ENTERPRISE EDITION available except the ability to record new macros. For distributing macros outside your company you can purchase the iMacros Component for .NET separately. The iMacros Component for .NET license allows unlimited, royalty-free distribution to anyone (outside your company, web downloads, cloud-based service, etc.). For more information and pricing for the iMacros Component for .NET, please visit the product, Wiki, and purchasing pages. Please see iMacros Player licensing examples for more information. You can distribute the normal setup executable from http://imacros.net/download. When installing your application on the end user's computer, you can easily call the iMacros setup from your own custom installer and install the iMacros Trial version. You (or the end-user) can then either manually enter the license into iMacros or you can use one of the approaches described below. Please note: If you are distributing your application to external customers, you need to have also purchased the royalty-free distribution license that is provided by the iMacros WebBrowser Component for .NET, as explained here. You need to distribute your Enterprise Player license file with your application and make an update to the registry. 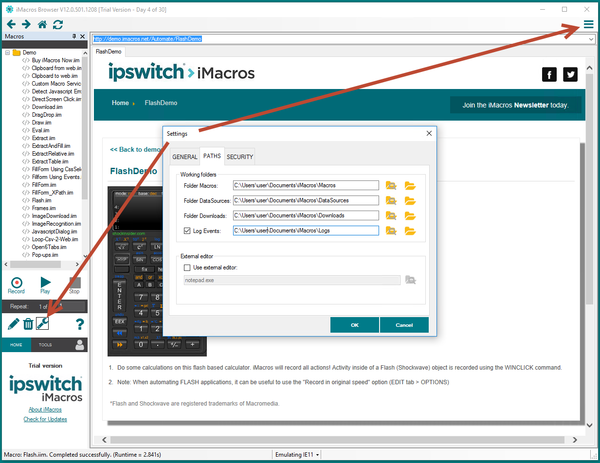 You can obtain your license file from your Ipswitch Community account as explained in this FAQ. You can give the license file any name and store it in any appropriate folder on the machine. The iMacros LicenseKey registry setting needs to contain the full path to the license file. The registry settings mentioned above are on a per-user basis (they are stored in HKEY_CURRENT_USER). So if multiple users intend to run your iMacros application on the same machine, you need to make sure the LicenseKey setting is configured for each user account, as mentioned in this FAQ. If you never obtained your old-style Player license key, you can generate one using your (old-style) primary Enterprise key on this page. The installer program accepts the following optional command line parameters. These instruct Setup to be silent or very silent. When Setup is silent the Wizard and the background window are not displayed but the installation progress window is. When a setup is very silent this installation progress window is not displayed. Everything else is normal, so for example, error messages during installation are displayed. If a restart is necessary and the /NORESTART command isn't used (see below) and Setup is silent it will display a "Reboot now?" message box. If it's very silent it will reboot without asking. Instructs Setup to suppress message boxes. Only has an effect when combined with /SILENT or /VERYSILENT. Prevents the browsers from launching after setup completes. Prevents the user from cancelling during a silent installation by disabling the Cancel button and ignoring clicks on the close button. Only works with /SILENT. Instructs Setup not to reboot even if it's necessary. Note that installing iMacros does not require a reboot unless iMacros was already installed and running on the machine during the setup. Overrides the default selected component displayed on the Select Components wizard page. If a component name is prefixed with a "!" character, the component will be deselected. iMacros installer component names are: iMacros_Browser (iMacros Browser), IE_addon (iMacros Extension for Internet Explorer), and scr_interface (Scripting Interface). The information contained in the log file is technical in nature and therefore not intended to be understandable by end users. Nor is it designed to be machine-parsable; the format of the file is subject to change without notice. The uninstaller program (unins000.exe) also accepts the following optional command line parameters. When specified the uninstaller will not ask the user any questions or display a message stating that uninstall is complete. Shared files that are no longer in use are deleted automatically without prompting. Any critical error messages will still be shown on the screen. Prevents the iMacros Uninstall Survey from launching after the uninstall completes. iMacros runs well on restricted user accounts, locked down systems and systems that use Active Directory services. iMacros folders (Macros, Datasources, Downloads, and Logs) are personal, so each user will have his own %USERPROFILE%\Documents\iMacros folder. However, only the user who installed iMacros will have the Demo macros in his User Profile folder. All settings used by iMacros are stored in the registry. We do not recommend editing these settings manually unless you know what you are doing. If in doubt please contact the iMacros Support Team. All iMacros settings are stored in the registry (see also this forum post for some use cases for manipulating the registry directly). But since you can change most settings through the user interface editing the registry is not required or recommended for most users. Note: The iMacros for Firefox settings are not stored in the registry. Here we follow the Firefox standard and store the addon settings in the Firefox user profile, so the iMacros for Firefox setting are per user. You can view and edit them by typing "about:config" in the address line. You can even select a certain user profile via the iimInit "-fxProfile" switch. This page has been accessed 315,161 times.